Building on the successful launch of the Skywise open data platform for airlines at the Paris Air Show in 2017, Airbus is now extending the scope of cloud-based big-data analytics into the supply chain. The new offering will connect selected suppliers to the Skywise platform, to enable unprecedented improvements in their reliability, quality, and performance and, more generally, transform aviation through better performance. 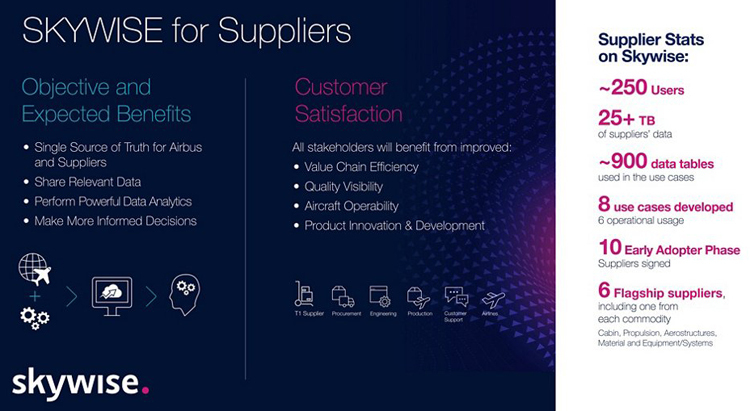 This is the first time that Airbus and suppliers are co-innovating with data sharing and analytics during an early adopter phase. Marc Fontaine, Airbus' Digital Transformation Officer said: "I'm very pleased to announce the next stage of uniting the aviation industry's data, by connecting suppliers to the Skywise platform. The scope and power of data integration technology, which only became available recently, is now bringing productivity gains which benefit all stakeholders in the aviation ecosystem – from suppliers and airlines to OEMs. When our aircraft are reliable and flying passengers, we are all better off." Skywise Dispatch will increase efficiency and responsiveness to supply chain disruptions. The application is designed to improve demand management, aircraft assembly configuration, and on-time delivery, notably to prevent line-stops. The application aligns supplier production planning and Airbus' demand to create a single 'source of truth'. This enables fast and easy root-cause analysis of recurring missing parts and anticipation, notably through a better visibility into production status. The lead partner in this pilot phase is Premium Aerotec. At the company, Skywise Dispatch is active across five functions where it is delivering 25% time savings, and full roll-out planned in Nordenham to 50 additional users. Dr. Thomas Ehm, Chairman of the Executive Board of Premium Aerotec said: "By using the collaborative platform Skywise, the company takes a big step towards its smart factory vision. Skywise allows full transparency and big data analytics on a huge amount of data in order to recognize trends that require early actions to ensure a stable manufacturing process." Skywise Object Explorer improves the quality of suppliers' services and commodities by reducing the cost of non-quality incurred by both Airbus and suppliers, reducing the occurrence of quality shortfalls by identifying such trends early and by accelerating resolution. The key partner is Thales, for whom the application has typically been delivering a 30% reduction in part removals due to non-conformities (on a per-component basis). Gil Michielin, EVP Thales, Avionics GBU said: "Skywise echoes the mutual goals for disruptive technologies pioneered across Thales and Airbus. Thales has accompanied Airbus' ambitions for decades and its scope of industry leadership spans all areas of the connected aircraft, from nose to tail and beyond. The cultural change of this new initiative perfectly complements Thales's multi-billion dollar investment in digital technologies. We are pleased to be strengthening our robust and trusted relationship with Airbus through this thrilling endeavour which aims at accelerating digital transformation throughout the aerospace sector." Skywise Spotlight brings together Airbus and suppliers in a platform where they can collaborate securely and in real-time to resolve in-service issues faster and more accurately by leveraging in-service aircraft data to identify the root-causes of operational issues and exploring how to improve predictive maintenance services for airlines. The pioneering team in this collaboration is the partnership between easyjet, Liebherr and Airbus. Each partner has already benefitted from the partnership on the platform. Nicolas Bonleux, Managing Director and Chief Sales Officer at Liebherr-Aerospace & Transportation said: "The projects demonstrated that bringing together a wide range of data and conducting holistic analyses enable us to realise a much deeper and better understanding of the in-service behaviour of on-board systems and components, developed, manufactured, certified and serviced by Liebherr." With this early adopter programme, Skywise is thus evolving into a true aviation platform by closing the loop between Airlines, Airbus, and Suppliers. The next phase of this partnerships will be to explore incorporating the OEM in the algorithm development to deliver improved predictive maintenance to airlines.